In previous posts we looked at several words that do not refer to eternal life: salvation and Kingdom of Heaven, and inheritance and reward. This post we will look at three more. While it may be true that justification and eternal life are very closely related, they are nevertheless distinct in biblical theology. It may be best to think of justification as being “in right standing” with God whereas eternal life is the actual reception of God’s life in us. The two are closely related and occur simultaneously when we believe in Jesus, but are still distinct. The critical point to remember is that neither the reception of eternal life, nor the declaration of righteousness actually makes one righteous in all their thoughts, actions, and behaviors. If it did, we would never sin again. 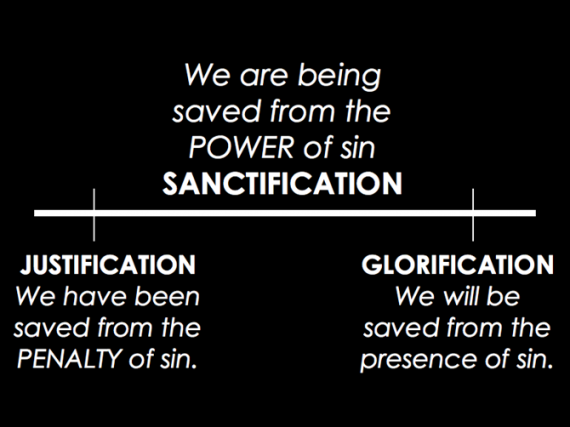 But we do sin, which brings us to the topic of sanctification. It is because of this ongoing sin that we need sanctification. This is the life-long process of being sanctified, that is, of becoming more holy. Sanctification occurs as we follow Jesus in discipleship and learn to love others like Jesus through the power of the indwelling Holy Spirit. Sanctification often leads to the temporal experience of eternal life, but is not eternal life itself. Through sanctification we begin to understand what it means to live under the rule and reign of God, and we begin to see other people as God sees them, and ourselves as well. Based on this brief description, you may realize that sanctification is vitally important for the Christian life. Indeed, it is probably not an overstatement to say that the vast majority of the New Testament is concerned with Christian sanctification. Glorification then, is the future event when we finally gain our perfect, glorified bodies. It is with these redeemed and sinless bodies that we will live forever with God and will serve Him and one another for all eternity. 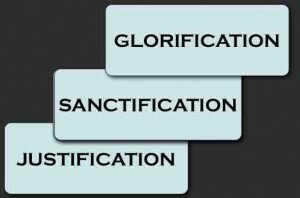 Though it is an oversimplification, we could say that if justification is deliverance from the penalty of sin, and sanctification is the deliverance from the power of sin, then glorification is the deliverance from the presence of sin. So justification, sanctification, and glorification are not themselves eternal life, but maybe it would be safe to say that they are aspects of eternal life. Justification is when we receive eternal life; sanctification is when we learn to live within eternal life; and glorification is when we fully experience eternal life. Q1. “Sign up to my religion and you will be made right with God, follow my religion and overtime you will become saintly, best of all after you die you will be free from sin.” Why the delays? You got a lot words wrong in your question. What is ‘religion’? Will be made right? Not in the future – You are to be made now and here. What does it mean ‘saintly’? It might take eternity, if you have a different idea on it. You are recovering to be after God’s image every day. Don’t look for the idea of ‘saints’ which Catholics love. Holy one is one who is consecrated to God – to be a saint? No. To do and do live, love and learn every day as you honor God’s Name in everything you do. Will be free of sin? No, it is sin guilt that is cover over over – mercy seat. It is from power of sin you are protected – not to become ‘sinless’. Thank you, but I understood well enough. The believer is justified now, sanctified over time, and glorified after death. My question is why the delays, Why doesn’t God sanctify us with a transforming zap. As for glorification, even atheists believe that they won’t sin after death. How do these delays help in the spread of the gospel or the life of the Christian? Any religion can say, believe and you will be made right with God. Sanctification sounds like moral development over time which is a natural human experience. The only difference is that the religion defines morality rather than the individual/culture. Glorification is a promise which happens after we die. Convenient. There’s an immediate benefit, a long term benefit, and a promise, like life insurance, that won’t actually be delivered until after I’m dead. Sounds like marketing. I’m challenging you, in the spirit of necessary opposition, to provide a logical explanation for the delays? Surely the believer wants to be sinless immediately, surely God wants the believer to be sinless immediately too, surely the gospel would shine like a light to the world if it’s believers weren’t so famously immoral. Everything points to no delays, yet,you say, here are these delays. Okay, explain why? Have you read what I posted? BTW, what is God? or rather, what do you mean by God? Everything (questions and answers and solutions) hinges on this answer. Everybody gotta have a god. Nowadays it’s hard to come by. It is lucky to have one – a ‘Good Ol’ Doc’. BTW, for theological jargon ‘justification. – It is not to ‘justify’ (make excuse, etc.). It is not ‘one is made right with God’. Nor it is to be ‘declared righteous’. It is to be taken as righteous by God. OK nice summary, except that glorification does not occur after death but after Resurrection (for those who have died) or after Translation (for those still alive when Christ returns). Here is one where a definition of GOD may be hidden. My dear Ounbbl (how is that pronounced?) if I understand your innovative answers, you think that the delays in sanctification and glorification are to teach the believer dependency on God. It’s a worthy reply, but does it bear reasoning? Doesn’t the fact that believers continue to sin show that they are unable to depend on God? And isn’t that inability precisely because they haven’t been set free from the power and presence of sin? Which is why the believer needs sanctification and glorification immediately. If God asks me to depend on HIm, wouldn’t He make it possible by freeing me from the power and presence of sin? What is He waiting for? Jeremy, I have a few question about justification. First, a bit of background. I was raised in a fundamentalist Christian environment during my formative years, found the GES position (I actually used to email you once-in-awhile and posted my youth pastor resume on the website at one point, many years back it seems lol), but later begin to look for some better explanations of things that were going on in my life outside the church of the west. Today, I no longer consider myself an evangelical Christian. There are some days I’m pretty sure I don’t fit the definition of Christian in any sense, though I come from a decidedly more eastern Christian perspective on the things to which I still hold. The word “justification” is one of them. It seems that throughout the classics that the word “righteousified” (I like that) had more of the idea of a person who was converted to live one’s life in light of the laws of virtue. Can justification in Paul be understood in this light? That is, we no longer follow the customary laws of the Old Testament, but the Royal Law (a word also used by Aristotle) as referenced in James 2, that to love your neighbor as yourself is the whole of it? So, in the sense that one has been brought to live a life in keeping with the Royal Law of Christ, “God considers [them] righteous.” This is a righteousness as a description of one who lives their life along a certain path (like the term is used in the OT) and sin is a deviation from this path. I love at being justified by faith as being justified by “the faith”, namely the faith Christ taught and lived. What are your thoughts on this? I think coming from a fundamentalist background, seeing the Greek philosophical uses of this terminology helps me recover a sense of a non-legalistic meaning and it avoids the problem of how you could be righteous without actually fully being so. Also, I should say that it seemingly puts Jesus is the company of other great philosophical and religious teachers who essentially say the same sorts of things, in their own contexts and in their own times as to how to find “eternal life” a phrase I think speaks of a qualitative type of life, a flourishing, if you will, both now and after death. I know you’re not going to agree with all of this, but I thought I’d put it out there for discussion to get your thoughts. Thanks for reading! ~ James. Thanks, James. I do remember emailing you. I actually have been having similar (??) thoughts about justification recently, though I am not sure what to make of it. How close is your view on justification similar to that of NT Wright and others in the “New Perspective on Paul” group? I have read what you have written about Calvinism. Very interesting and many things has been explained. You are very, very good in explaining things and I really enjoy reading what you have written. I’m almost finished with the book you sent. We have very few good books translated into Swedish. I looked at N.T.Wrights books and none of them are translated into Swedish. One thought that I have had is about sanctification. Maybe you mean the same so this is what I want to check. As I realize God loves me and that He will never leave me at any point the more I start to rest. The more I soak in His love for me the more I will loose the necessity to sin – sanctification. For example I don’t have to want anything because I start realizing God has given me everything, I can forgive because God has forgiven me. I’m thinking of what Jesus explained with living water to the woman at the well. When I let God fill me with His love for me it will eventually run over and be a fountain of living water to others. If I try to produce love or good deeds I will dry out. If I know I’m in Gods hands no matter what and I learn to KNOW Him the temptation to sin will diminish. Not because of anything I do, but because I’m starting to see more and more about what He has done for me. This is my thought when I read John 15 about being in the vine, not being able to do anything apart from Christ. I really agree with you on doing according to the revelation He gas given me. It’s walking on that narrow road. But it does involve doing nothing at times. Just as Mary did – she sat down and listened. Very important. The things He teaches us gives us His incentive to do. I’m doing it in His rest and peace and with Him/ in Him. We want to tell people about what we have done, but I think that things I do resting in His love for me will never reflect back on me and probably I might not even understand what I am doing. People might not even remember I was involved – and I won’t see it either. Maybe – when I meet Him He will show me a list of all those things and I will say “What?? ?” And things I think I’m doing for Him will not be on that list. Because when I did those things in/ with Him my eyes were fixed on Him and His complete love. That is how I understand sanctification. It’s all about getting to know Him. Working out my salvation might be this. I appreciate so much of what you write about on your blogs. You bring lots of Scriptural truth into the light for people to see and gain understanding. Bless you! But I must challenge you to reconsider what you have presented here, which is in line with the common teaching of the church today, but not in line with the Scriptures. The concept of justification now, sanctification over time, and glorification in the future was developed because of the common misconceptions surrounding salvation, which you address so well in other posts. Theologians unable to comprehend salvation (from sin) already received (Eph 2:8) apart from salvation (from wrath) yet to be received (Rom 5:9-10) constructed this concept to build a bridge to unify two separate works of salvation into a single entity. But when you examine the Bible, you see clearly that we have already completely received not only justification, but also sanctification (“holy-fication”). That’s why we are declared to be saints (“holy ones”) right now. Presenting myself to Christ as my Lord, I received the gift of the HOLY Spirit of God who lives inside this earthsuit with me, making my body a HOLY temple of the Spirit of God (1Cor 6:19). Sanctification is not a process, but an act of God whereby a person or an object is set apart for special godly purposes. Whether it be children (Num 3:13; 8:17), priests (2Chr 5:11; Eze 48:11), the temple (2Chr 36:14), Jesus (Jn 10:36), or the saints of God (1Cor 1:2; 6:11; Act 20:32; 26:18; Rom 15:16; Heb 2:11; 10:10, 14, 29), when God consecrates someone or something, it is to be regarded as special, holy, reserved for His work (sort of like the good china set aside for special occasions, not the everyday plates). Growth is a process. “Growth” is not a fancy theological term, but this is what we all experience as we keep following Jesus. As we grow, we do a better job of walking in the sanctification which has already been given to us. But I am qualified, by the work and presence of the Holy Spirit in my life, to wear priestly garments as a representative and ambassador of Jesus Christ from the very first day of my relationship with Him. I will certainly get better at what the Spirit teaches me to do, but I am a certified priest from day one. I have already been fully sanctified. Likewise, “glorification” has been severely distorted in common church teaching. Glorification is not about what happens in heaven. But rather than lengthen this already too-long sermon, I hope your interest has been piqued sufficiently to discover for yourself the wonderful truth the Scriptures teach us about glorification. It’s exciting news that actually contradicts what you’ve probably heard from the pulpit. Read it and rejoice!